WHEN a group of Welsh businessmen decided in 1863 to use steam engines to haul slate from the mountainous inland of Wales to export wharves on the coast, there was much chortling from cynics across the border in England. Amongst them was Robert Stephenson, son of railway pioneer George Stephenson and who like his father was a railway engineer and locomotive builder, and Isambard Kingdom Brunel, the engineer responsible for England's Great Western Railway. "Locomotives for such a narrow line will not have the power to haul wagons loaded with heavy slate," the critics scoffed. "It is all an unsafe folly." 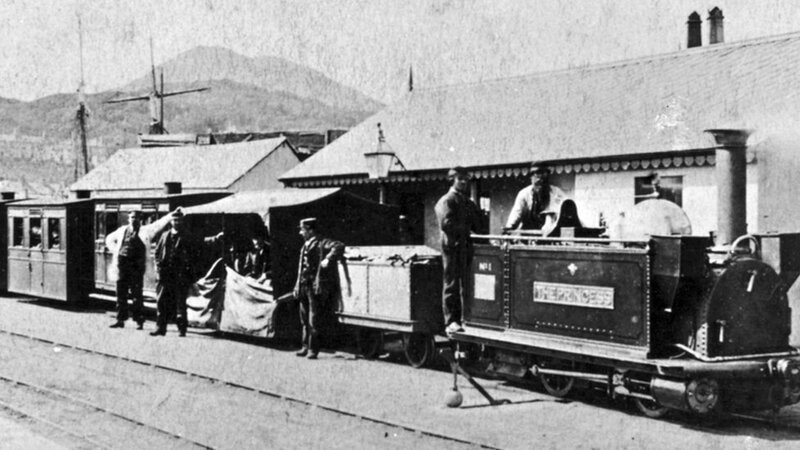 But with booming demand for slate, the Welsh ordered four Lilliputian-size steam engines for their Ffestiniog Railway Company (in Welsh Rheilffyrdd Ffestiniog Ac Eryrl) – until then their "slate trains" were operated by a simple combination of horse-power and gravity. And as if the ghosts of those rail pioneers are today rubbing the noses of their detractors into the slate their little trains once hauled, Ffestiniog is now the world's oldest surviving railway company, next March celebrates 150 years since the introduction of its first steam engine – and as a member of The Great Little Trains of Wales is one of Britain's major tourist attractions, with its sister company the Welsh Highland Railway carrying 300,000 guests a year between them. And that tiny first steam engine, that was called Princess and which went into operation in 1863, is still around today, currently enjoying a make-over for those 150th anniversary celebrations after somewhat bizarrely being "conserved" since 1981 in the bar of a Welsh pub. 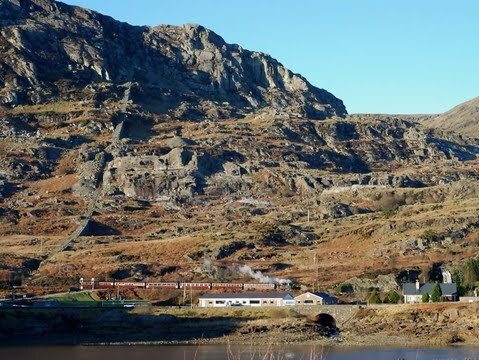 When the "railway" first opened in 1832 slate mined from around the mountains of North Wales was loaded into rail wagons at Blaenau Ffestiniog, and allowed to free-run by gravity 13½ miles (21.7km) downhill to the wharves of Porthmadog – with two brakemen in a rear wagon controlling their speed. 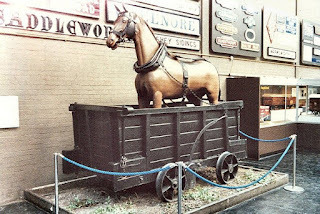 And a horse was carried in another wagon called a "dandy," to haul the eight empty wagons those 21-odd kilometres back up to the mines. But such was world demand for Welsh slate, particularly for making roofing tiles, that the rail company realised it needed to get its trains back into the mountains faster than its horses could haul them, and decided in 1863 on its diminutive little steam engines. They proved an instant success, and it's known that many visitors to Wales would also request a quite illegal ride into the mountains in the empty steam-hauled slate wagons, prompting the railway to build pint-sized passenger carriages that it added to its slate trains to earn extra income from locals and tourists. But by the 1940s new roofing materials were replacing slate, many overseas markets had been lost during two world wars, tourists in the 1930s had turned to the motor-car and charabancs (long wheel-base, open-air sightseeing vehicles,) and the little trains of the Ffestiniog Railway were considered out-dated and run-down. 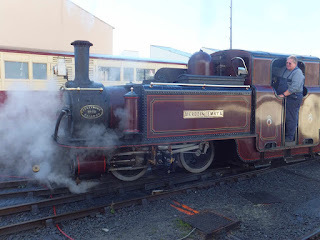 Thus the railway closed in 1946 – but dedicated rail enthusiasts refused to see it die, and miraculously between 1954 and 1982 re-opened it by largely volunteer labour section-by-section along nine stations as a tourist line. And as part of the track had been submerged when a new dam was built, they also had to construct a 4km deviation and blast a 280m long tunnel through solid granite. 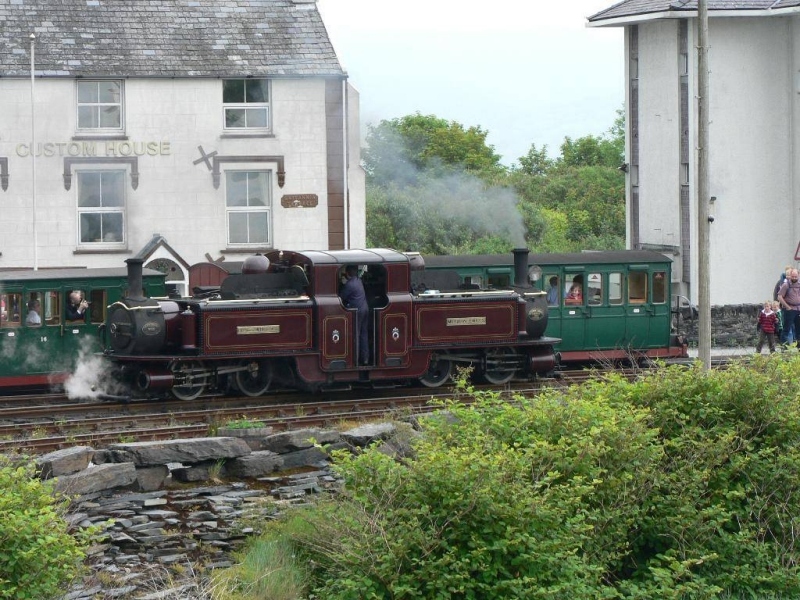 Three of the original steam engines were also restored together with recovered historic carriages and put back into service, while others including a unique double-ended Fairlie were more slowly restored for increasing tourist runs from Porthmadog through the spectacular Snowdonia National Park to Ffestiniog. 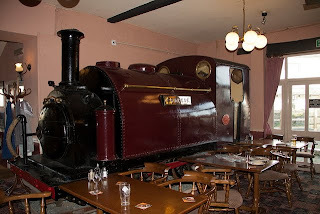 The first, Princess was not deemed capable of running again and was spruced up and "conserved" in the bar of Spooner's Pub in Porthmadog – where it remained until several weeks ago, when it was moved to London for a make-over to look nice for next year's 150th anniversary celebrations of the world's first narrow gauge steam railway.